Ai Weiwei wasn't always a dissident, at least not officially. It wasn't until the Sichuan earthquake in 2008, when the Chinese government refused to release the names of over 5000 children who died in the disaster, that Weiwei confronted the government directly. He produced a performance piece that read each child's name continuously and posted it online. Since then the Chinese government has kept him under constant surveillance. Weiwei continues to speak out. @Large: Ai Weiwei at Alcatraz, a potent and provocative installation at America's most notorious prison-turned-national-park, embodies the idea that freedom of expression cannot be silenced. The seven installations in four separate buildings are integrated into the standard Alcatraz tour. Weiwei's work, however, transforms the crusty prison, confronting visitors with stark contrasts and bringing up questions about freedom and human rights. On April 3rd, 2010, police arrested Weiwei without charge and detained him at an unknown location for 81 days, finally releasing him on June 22nd without explanation - and without his passport. He cannot leave China. 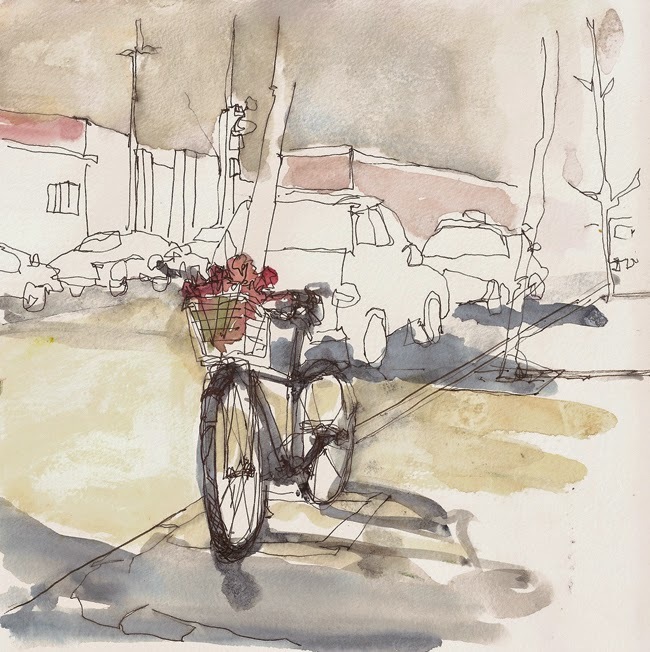 A bicycle whose basket of flowers is refreshed daily sits just outside the door of his Beijing studio, beneath several surveillance cameras - a silent statement. 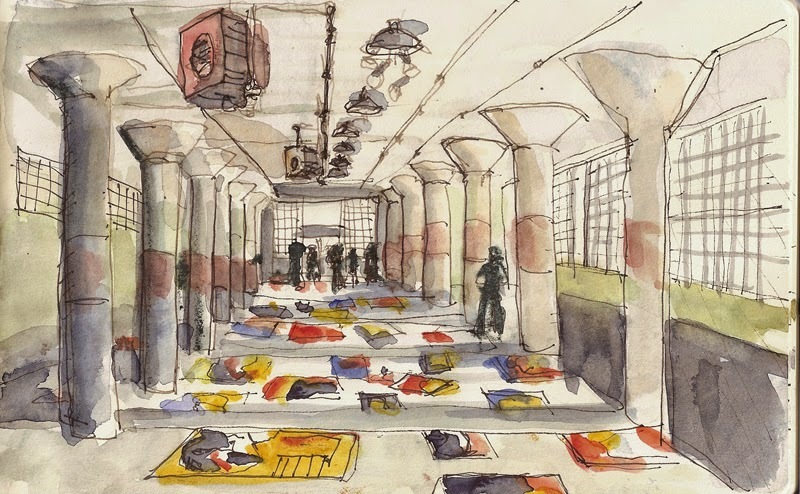 Because he cannot leave China, Weiwei used books, memoirs and photos to study the Alcatraz prison site, mapping its construction and layout while designing the exhibition. Weiwei's staff, park staff and local volunteers assembled the installations. Weiwei uses the opportunity of the exhibition to speak about what happens when people lose the ability to speak freely, and to bring the conversation to a wider audience. He researched political prisoners throughout the world, and uses this opportunity to bring them, the repression they suffer and their causes to our attention. The theme of human rights, freedom of expression and the political repression present in many countries - including the United States - runs throughout the exhibition. THE NEW INDUSTRIES BUILDING is the vast structure where inmates worked doing laundry for military bases and manufacturing goods for government use. The three most visually dramatic installations are in this building. 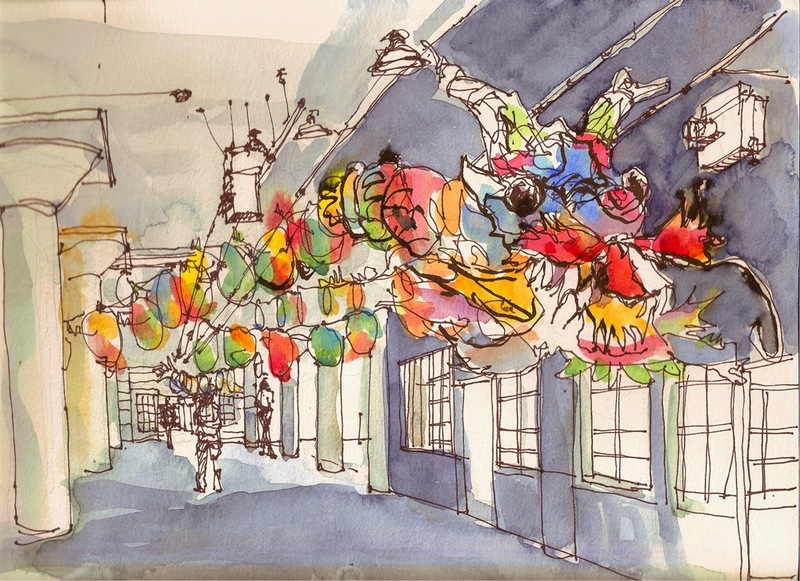 A traditional hand-painted silk Chinese dragon kite seems to burst through the confinement: the head confronts you at the entrance, and the body, consisting of hand-painted discs, winds through tall pillars in contrast to walls with peeling paint and exposed rusty pipes. Some of the silk discs display quotes from political prisoners, including Weiwei. 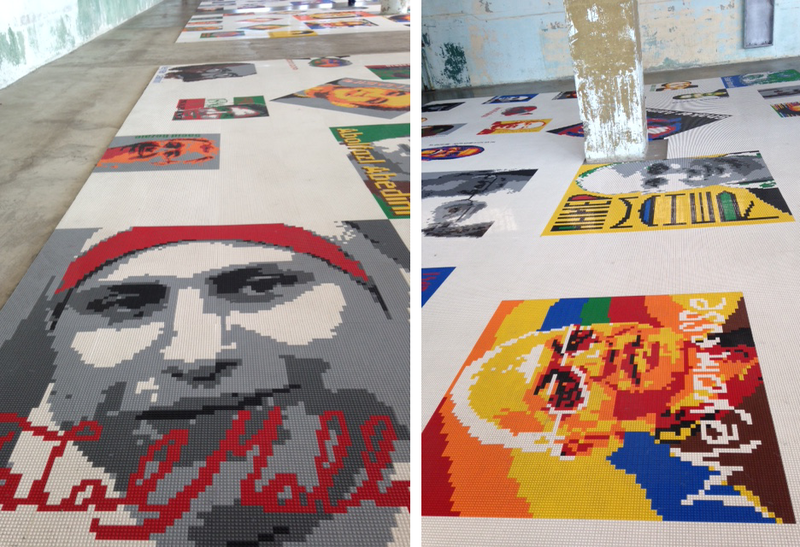 The signature art piece of @Large: Ai Weiwei at Alcatraz consists of panels with 176 faces made of millions of Lego blocks, covering the floor in a patchwork of color. Each face is the portrait of a real person who has had some experience of political imprisonment. Some are still imprisoned; some are now free; some are deceased. 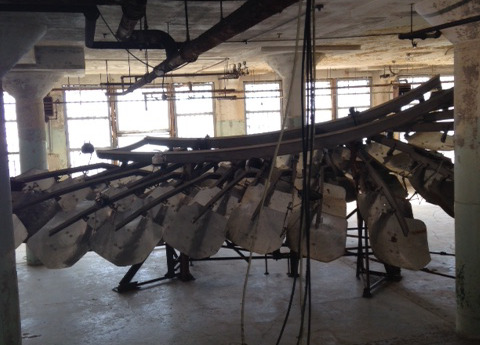 A massive sculpture sits in the basement of the New Industries Building. It consists of a monstrous wing, the feathers of which are constructed using reflective panels from Tibetan solar ovens, calling to mind Tibet's long struggle with the Chinese government - a wing enclosed, captured even, by the prison walls. Prison cells, empty apart from a stool and headphones, invite viewers to sit inside, getting a sense of imprisonment while listening to the recorded voices of political prisoners - those who have been detained for expressing their beliefs. Isolation and expression. This installation in the sterile psychiatric observation room resonates with chanting from both Tibetan monks and Native American tribes, drawing a direct correlation between the Chinese and American governments' oppression of native people. In 1957 Chairman Mao initiated the Hundred Flowers Campaign, inviting the population to free expression of their ideas about the governing of China. As criticism of Mao increased, he changed course, with what is known as the Cultural Revolution. Dissidents - now easily identified from their free expression - were publicly humiliated, arrested, tortured, sent to labor camps and even executed. Weiwei's family was sent to Xinjiang Province, a remote area of Western China. His father Ai Qing, once a lauded poet and scholar, was forced to work daily cleaning communal toilets; their family ate seeds to survive. Knowing a little of what Ai Weiwei's family experienced gives deeper understanding of his crusade for free expression and human rights. Blossom transforms fixtures - toilets, bathtubs and sinks - with the installation of fragile porcelain flowers alluding to the Hundred Flowers Campaign and the possibility of transformation through free expression. Again, a memory of Ai Qing, Weiwei's father, informed the last installation. While the family was still in the labor camps, Weiwei's father received an anonymous postcard announcing the 30 year anniversary of one of his poems. His father was deeply touched to know that he was remembered. Yours Truly encourages viewers to participate in a global conversation and to act to let individual prisoners know they haven't been forgotten. 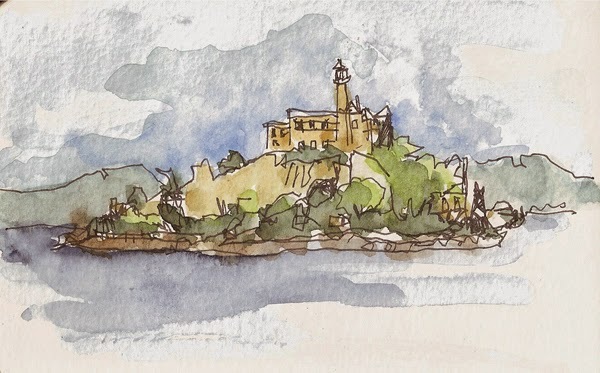 You can choose from any number of postcards, each addressed to a specific prisoner, with a symbol of the country where that prisoner is detained. The cards are mailed to the individuals to let them know that they are indeed remembered. "The misconception of totalitarianism is that freedom can be imprisoned. This is not the case. @Large: Ai Weiwei at Alcatraz will run until April 26th 2015. Jane Wingfield is a Correspondent from Seattle. This article was originally posted in Seattle Urban Sketchers.